Sean Murphy‘s Batman: White Knight continues with Batman: Curse of the White Knight which will come to shelves in 2019. The series will be published under DC Black Label, the same label the trade of the first volume is being published under. It originally was published under DC Comics. The Joker recruits a savage partner to help him expose a shocking revelation about the Wayne family’s legacy and run Gotham into the ground. As Batman rushes to protect the city and his loved ones from this corrupt conspiracy, the mystery of his ancestry unravels and deals a devastating blow to The Dark Knight. Exciting new villains and unexpected allies will clash across history in this unforgettable chapter of The White Knight saga, and the truth about the blood they shed will shake Gotham to its very core! Batman: White Knight is currently available as single issues and the trade is collected October 3rd. DC Collectibles in April 2019 Includes New DC Bombshells, Artists Alley, Harley Quinn and More! Also in April 2019, DC Collectibles will release new cutting-edge DC Artists Alley designer vinyl figures by fan-favorite toy designer Joe Ledbetter. Ledbetter is known for his distinct, bold lines and vibrant palette and has worked with such top brands as IKEA, Swatch, Nike, Sony Music and Kidrobot. Now Ledbetter will bring his unique style to the DC universe, putting his signature anthropomorphicspin on iconic characters Batman, the Penguin, Catwoman and Robin. Bestselling writer Rick Remender teams up with superstar art team Sean Murphy and Matt Hollingsworth for a bleak and poignant reflection on the consequences of tech-addiction in Tokyo Ghost, Volume 1: Atomic Garden. This collects issues #1-5 into trade paperback and will be available in March. Tokyo Ghost, Volume 1: Atomic Garden (ISBN 978-1-63215-663-1) hits comic book stores on Wednesday, March 9th and bookstores on Tuesday, March 15th, and will be available for $9.99. Today, DC Comics revealed two new retailer covers for Dark Knight III: The Master Race #1. The comic hits shelves November 25th. These retail variants are exclusive to the store and these are just two of a whole bunch coming out. Frank Miller has inspired artists and storytellers in the industry for generations. Paying tribute to 1986’s Batman: The Dark Knight Returns, Jae Lee designed Custom Retailer Variant cover art for Dynamic Forces (Dynamic Forces), and Sean Murphy designed Custom Retailer Variant cover art for Rebel Base Comics & Toys (Rebel Base Comics & Toys) in Charlotte, NC. And these are just the beginning! Stay tuned. The current list (to date) is below. San Diego Comic-Con’s preview night kicks off tomorrow! We’ll be there, so make sure to follow us on Twitter for various updates for the show. It’s also new comic book day! Until then, here’s some news and reviews from around the web, and we’ll of course have our suggestions for this week’s books in a few hours. The Beat – Sean Murphy drops truth bombs on Comics’ ongoing money problems and more – This is some hard truth. The Comichron – Secret Wars #3 tops June 2015 comics sales; first half of year up 13% – Good info on the market. Newsarama – Cyberforce To Return As Digital Series By Silvestri & Hawkins – Guess the Kickstarter didn’t help in the long run. Kotaku – Photographer Captures Cosplayers Both In And Out Of Costume – This is pretty cool. Batman is one of the most iconic superheroes of all time. He made is landmark first appearance in Detective Comics #27 in 1939. The incredible influence of The Dark Knight has transformed the comics industry through the decades, and Batman is just as relevant and beloved by fans today as he was when he was firs introduced 75 years ago. To kick off the celebration of his 75th year, DC Comics assembled an all-star roster of writers and artists to contribute to this special issue of the latest volume’s Detective Comics #27 that clocks in at almost 100 pages. The issue is a celebration of the character and spans the past, present and future giving us many looks at the character throughout the ages and it’s all very solid. With so many different creators and so many different styles, you’d expect some variance in quality, but here everything is a great read. The issue also kicks off John Layman and Jason Fabok’s new storyline for the series Gothtopia. It’s a bright, shiny, happy place where dreams come true… as long as you don’t look at things too closely. This first part of the story is a little odd in the fact that we were presented with so many different versions of Batman, at first I thought this was just a different version. After a while I caught on and it’s a cool story so far that has me wanting to check it out further, though maybe not the many tie-ins. Overall, the issue is a celebration and comes off as such with an amazing line-up of creators. You can see why he’s so popular and with so many versions shown of him, he really is a character that can fit any age and time. This is a definite buy for fans of Batman and worth checking out if you just want to dive in and check him out. Launching next spring, Batman Eternal is an all-new weekly series that comes to you from “showrunner” and Batman writer, Scott Snyder, along with writers James Tynion IV, John Layman, Ray Fawkes, and Tim Seeley, and artist Jason Fabok. Snyder in a release gave some details about Batman Eternal will “set the stage for a new Gotham and new characters and a new set of stories that will take Batman into 2015. We want this to be a place where you get to tell a story about anything you want in Gotham, so long as we’re also moving this big story forward in the background. You’ll see bombastic arcs as well but there’ll be plenty of room for Ray to explore some of the darker, more mystical aspects of Gotham that he loves or Tim to explore some of the crime we haven’t seen before. We’re five guys doing our best to give you an exciting Gotham that’s changing under the feet of its characters. But Batman Eternal is not the only Batman news revealed this morning. 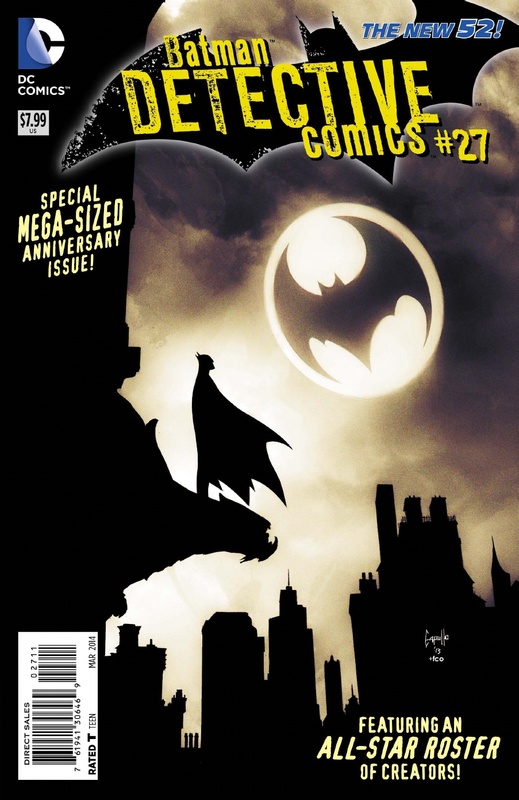 DC Comics also announced that next year’s Detective Comics #27 will be a mega-sized anniversary spectacular! Spanning 104 pages, Detective Comics #27 serves as an homage to the original Detective Comics #27, which marked Batman’s comic debut in 1939, and features an all-star roster of Batman creators past and present! In stores January 8, the issue includes a modern-day retelling of the Dark Knight’s origin by the incredible team of writer Brad Meltzer and artist Bryan Hitch! Plus, all-new stories by Scott Snyder and Sean Murphy, Peter J. Tomasi and Guillem March, Paul Dini and Dustin Nguyen, Gregg Hurwitz and Neal Adams, new art by legendary Batman writer/artist Frank Miller, and more! This issue – which will include variant covers by Neal Adams, Jim Lee, Greg Capullo, Chris Burnham, Kelley Jones, Patrick Gleason and Mike Allred – also includes John Layman and Jason Fabok’s final storyline, “Gothtopia,” before the new creative team of Francis Manapul and Brian Buccellato take over writing duties for the series in the spring. We want to bring him closer to his roots and be more of a street-level type of hero. His superheroics will still be present, but the investigative part of Batman will be at the forefront …We’ve always written stories about hope, and it will be very interesting to see what comes out when we walk through the sullen streets of Gotham City. Stylistically, we will use the tools in our toolbox to capture what we think the Bat-universe looks and feels like. Gotham won’t look like Central City, so you won’t be seeing all the bright reds, oranges and yellows that defined Flash’s world. 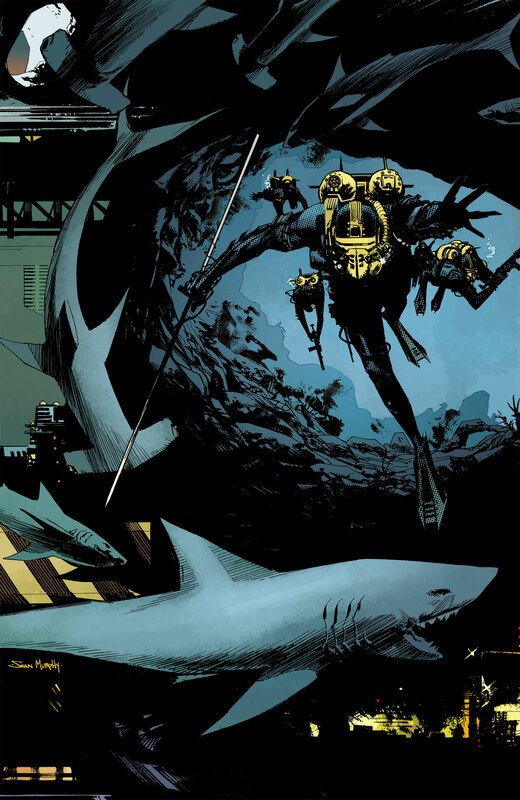 The Wake is many things, with several common threads running throughout, any of which Scott Snyder (W) and Sean Murphy (A) could bring to the forefront of the story. The first issue was really solid world building; the second issue was told out of order, presenting us with a narrative as curious to the reader as it was to the characters; this third issue, though, represents to me the culmination of the story thus far. It represents to me the conclusion of the first part, or at least the first movement, of the story. As I mentioned before, through all of the three issues thus far, there are common threads: history and evolution, the sea, claustrophobia, fear, hallucination, danger, etc. As the climax of the first movement (I think I’ll stick with “movement;” to me it implies an easy transition to the next segment of the story), #3 takes all of those common threads, expanded in the previous two issues, and blows the story wide open for the reader and the characters; at last, everyone is on the same page. And oh God, what a horrifying page it is. Not only do we finally understand the power and abilities of the creature, we also understand its biology a little more; we understand that the echoing noises it makes aren’t screams of pain or anger, but rather a language. It’s calling for its brothers, and its brothers respond. The final splash, showing divers in the foreground, and what could be hundreds of the mer-creatures in the background at the top of the page, signifies a new status quo for Lee Archer and her team, as well the reader. Now everyone knows that the creature they captured isn’t the last of its kind at all. The next movement of this story should be full on claustrophobic, psychological (and literal) horror. I’m excited to see what happens in the second movement. And I can’t end any review of The Wake without mentioning the stellar art (once again) of Sean Murphy. His character design is tremendous: his characters are angular and strong, and while they aren’t realistic, he’s taking realistic human attributes and heightening them to something more. To their extreme. Knees are pointy; fingers are crooked. It matches the realistic-but-more feeling of the underwater oil rig, as well. Like the creature itself, everything is recognizable but also alien, providing the book with its most potent source of horror. Let me also take a moment to point out Matt Hollingsworth’s colors. The rig and characters are awash in pale colors: blues and greens and purples. This makes the flashes of violence (the red of blood, the orange of the muzzle flashes, and the glow coming from the creature itself) almost luminescent. There’s really nothing about this team on art that I take issue with. The Wake is one of those books that makes me glad that I’m not waiting for the trade. Each individual issue has so far been an expertly crafted piece of art, making the wait between issues bittersweet; I can’t wait to dive back in a read #3 again, but I know it’s going to make the wait a whole lot harder. They call it the “Ghost Rig.” A secret, underwater oil rig filled with roughnecks and scientists on the brink of an incredible discovery. But when things go horribly wrong, this scientific safe haven will turn into a house of horrors at the bottom of the ocean! With the second issue of this new max-series by writer Scott Snyder and Sean Murphy we get a bit more of the mystery pulled back giving us a better idea of what we have in store for us. With a team assembled and a mystery set before them, we get theories and ideas as to what they and we the readers are presented with. All along mystery builds as well as the tension. What’s fantastic about this issue is Snyder’s use of real scientific theory to drive his story. He presents it in such a way that it doesn’t bog down the story and while it might sound like science fiction it is a theory of mankind’s evolution. I found myself Googling away after this issue to see if what Snyder presents is based in reality. It is, though not generally accepted theory. At this point you can see the series isn’t a straight up horror story, instead delving a bit more into themes about the origin of mankind and more than likely more. There’s also some crazy sequences here that just made my jaw drop. They didn’t make sense in the context of the issue, but you better believe each made me want to come back for the third issue. All of this is back up by artist Murphy’s distinctive style. This is shaping up to be one of the most interesting limited series of the year.